Whether it's a flying competition or an art show, these companies prove that businesses of any size can host a memorable event. When you think of an annual hot dog-eating contest or a Thanksgiving day parade, what brands come to mind? Nathan's Famous and Macy's? That's because they're both events that have become a part of our pop culture thanks to plenty of media attention, public curiosity and a strong connection to the brand itself. Just like Macy's Thanksgiving Day Parade and Nathan's Famous Fourth of July International Hot Dog-Eating Contest, a successful business-sponsored event will leave an indelible mark on your intended audience. If you think your small business can't compete with the ranks of Macy's, think again. Dr. Joe Goldblatt, senior lecturer at Temple University's School of Tourism & Hospitality Management, says no business is too small to create a memorable event. "Creativity expands any budget," says Goldblatt. "First, find a cause relevant to your corporate mission. Then, find partners to work with. Lastly, ask yourself, is it feasible? Is it viable? Is it sustainable?" Don't be surprised if your event isn't an instant hit; Goldblatt says the first year of any event is usually rough. Check out these 10 standout business-sponsored events for inspiration about how you can promote your business while having fun. 1. 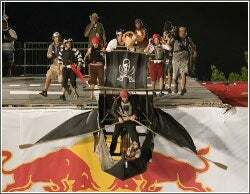 Red Bull's "Flugtag" flying competition: You may not know this event by name, but you've likely seen images of it. Picture people dressed up in funky team costumes, climbing into a contraption and launching it off the end of a ramp hoping it will soar into the air. A majority of the time, however, there isn't any soaring involved. Instead, these quirky pilots plummet straight into the water below. The recent Flugtag event in Austin, Texas, drew the largest North American audience to date--more than 85,000 spectators. The event, along with several others the energy drink company sponsors, including the Air Race World Series, ties in perfectly with the company's mantra, "Red Bull Gives You Wings!" 2. Flying Dog Brewery's "Bad Art for Bad People" art show: This ongoing event, which launched in June, combines Denver's local art scene with refreshing brew to create a rock-star art gallery. Featuring art ranging in price from $10 to $3,000, the four-day event gives amateur collectors the chance to purchase their first piece and gives artists the opportunity to reach a new audience. The brewery offers free beer for the $10 admission price. 3. Southwest Airline's "Pro Tow" tug-of-war: Southwest Airlines, known for its positive corporate culture, likes to take any opportunity to celebrate. This airline goes out of its way to decorate gates, dress up for Halloween and pitch in for good causes. One event that stands out is the airline's "Pro Tow" for charity event that takes place during the Super Bowl. As the "official airline of the Super Bowl," Southwest lines up professional football players against local muscle men to see who can pull a 100,000-pound airplane 50 yards in the shortest amount of time. 4. DaVita's Tour DaVita bike ride: During Tour DaVita, a bike ride to build awareness of kidney disease and raise funds for treatment, the company's employees cover 230 miles through Alabama and Tennessee in four days. The ride's mission is personal for the company, since it's one of the largest providers of kidney dialysis services in the U.S., serving approximately 100,000 patients. This year's event, which took place September 12 to 15, met their fundraising goal of $500,000. 5. L.A. Fairchild Boutique & Denim Bar's fall fashion show: This company is known for bringing "Soho meets So-Cal style" to the small beach town of Cardiff-by-the-Sea, California. Sisters Laura and Julie Fairchild are spicing up the quiet surf city by throwing signature fashion parties every year to introduce new fall trends and to celebrate the boutique's anniversary. Last year's theme? Black and white. The party also featured a hip-hop dance performance by the dance team Formality. 6. The Nike "Run Hit Remix" race: Plenty of companies sponsor foot races, but Nike took its "Run Hit Remix" race to the next level. This year's 5-mile course weaved through the streets of Los Angeles with bands on the sidelines motivating runners to keep their pace. Runners rocked to tunes by Naughty by Nature, Sir Mix-A-Lot, The Sugarhill Gang, Dawn Robinson of En Vogue and a finish-line concert by "You Can't Touch This" rapper MC Hammer. 7. HD Supply's "Maintenance Mania" competition: How fast can you change a light bulb? That and other questions will be asked at HD Supply's "Maintenance Mania" event. HD Supply, a leading wholesale distribution company, aims to recognize maintenance technicians nationwide with its annual competition. The company works with the National Apartment Association to organize the event, which is comprised of seven different challenges pitting maintenance technicians against each other for the fastest times. The final event: building a race car using at least one maintenance part and racing it down a pinewood derby-style track. The winning team receives more than $10,000 in prizes from national sponsors. 8. Avon's Walk for Breast Cancer: Avon, which touts itself as "the company for women," uses its position as a leading global beauty company to elevate the fight against breast cancer. Avon sponsors the Avon Walk for Breast Cancer in cities across the country, from Los Angeles to Boston. Between 2003 and 2006, the Avon Walk for Breast Cancer series raised more than $150 million. Funds raised by the events are awarded to local, regional and national breast cancer organizations to support breast cancer research. 9. Oakley Pro/Am Series of golf tournaments: The shades maker is teaming up with Corona to increase brand awareness at the "Crown Jewel" Oakley Golf Pro Am Series. The series, which features 11 tournaments nationwide, kicked off in Las Vegas earlier this month. But this isn't your traditional game of golf. Throughout the course, Oakley placed skull-and-crossbones pin flags along with speakers blaring rock-and-roll for golfers, including L.A. Laker Luke Walton and Oakley Golf's Ricky Barnes. 10. Disaboom's "Ride for Rehab" cross-country ride: This new online community, which officially launches this month, found a way to spread the word about its website across 3,861 miles--from San Francisco to Boston. Disaboom is the first online community for people living with or directly affected by disabilities or functional limitations. Dr. Joel Press, president of the American Academy of Physical Medicine and Rehabilitation, rode across the country over a 10-week period to raise awareness about the role rehabilitation plays in improving quality of life for patients. During his journey, Press participated in local events and fundraisers.